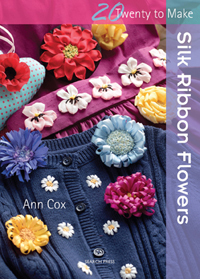 By providing simple, stylish flower designs in ribbon embroidery, Ann Cox gives a new twist to this traditional technique. With 20 pretty designs to choose from and ideas for how they can be used to decorate clothes, accessories, cushions, etc. new embroiderers can discover this traditional technique. Learn how to twist, fold and stitch narrow ribbons to create stunning yet simple designs.